Home Africa Arewadevs Colab Fintech Hardware Innovation Startups tech Trending in Tech Welcome to Dot. 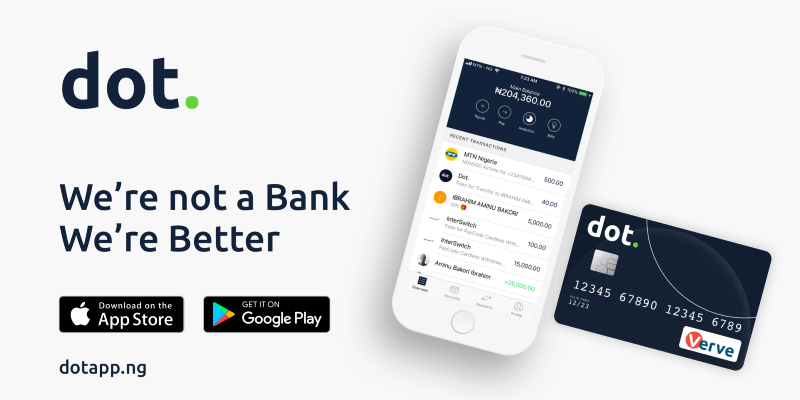 We’re building the next generation mobile payment service that lives completely on your mobile device and gives you full control of your money. also coupled with a card that allows you to withdraw cash at ATMs and make payment at POS/Web terminals across Nigeria. notifications or any other service is only one click away. While it’s difficult to receive money directly into your traditional accounts internationally, your Dot. the account can receive funds from anywhere across the globe. You simply give your personal Dot. link to anyone and you’re good to go. Transfers can be made to any commercial bank, micro-finance bank or mobile money wallet in Nigeria. You can also send money to any phone number or email address. When they claim the funds, the next time you are transferring to them, the money would be sent directly into their bank account. Saving with Dot. is a whole lot easier too. Pockets on Dot. allow you to easily save for the next vacation trip, buy a new car or house or basically save for anything. You even can choose to earn huge interests of up to 10% pa as you save. cheapest, simplest and most transparent banking service. Charging you transparently and only when it is beyond our control. The Dot. card allows you to make cash withdrawals at any of the over 5,000 ATMs across the country and also make POS/Web purchases. Think of it as the only card you need after linking all your previous cards on Dot. You can fund and manage it directly from the mobile app. If you are a developer, imagine what you could build if your bank had an API. Our developer API makes it a lot easy for businesses to build on advanced modern payment infrastructures. Lastly, we’re focused on making the best banking service in Africa starting from Nigeria. bug you might have seen while using it. We would also be listening to your ideas of how we can improve our service. too from Dot.? Yes, you can.